Six Degrees | Brands That Embrace Socio-Political Issues: Brave, Foolish or Exploitative? 24 Jan Brands That Embrace Socio-Political Issues: Brave, Foolish or Exploitative? More and more consumers are seeking, if not demanding, brands that mean something … that stand for something bigger than the individual product or service involved. Not surprisingly, many brands are now seeking to represent a bigger meaning or purpose in order to enjoy a more engaged and ultimately loyal customer base. 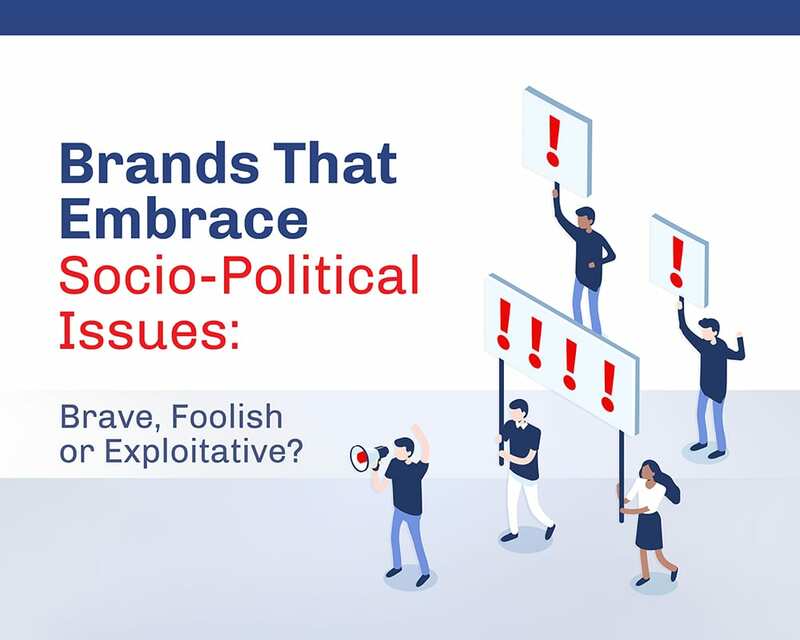 Amid the heightened public debate around socio-political issues in today’s culture and society, brands are starting to take a stance on these issues in ever bigger numbers. Needless to say, this can be a dangerous game to play, and while there are those who have shown some success with it, there are numerous brands that have tried and failed at aligning themselves with social or political issues. Simply put, a brand that is experienced at marketing a product or service but has no prior association with socio-political issues and no depth of experience with those issues can very easily come across as inauthentic – or worse, as woke-washing: hijacking a social justice issue in the pursuit of an ulterior motive like brand sales or share. For example, consider Nike’s ad with Colin Kaepernick about civil rights and Pepsi’s ad with Kendall Jenner about police brutality. Both of these ads garnered huge reactions, some positive and some extremely negative. But why did Nike’s ad work out so well while Pepsi’s ad failed massively? And where does the recent Gillette ad fit in? Nike knew its ad would cause conflict. It is bold, no-frills and risky. It’s clear that Nike knew it would lose customers by aligning with Kaepernick and by taking such a strong stance on civil rights issues, and Nike’s high, very real risk of losing money makes it feel more genuine. By aligning with a public figure heavily involved and influential in the current civil rights movement, Nike prevented itself from coming off as woke-washing the issue. The ad ends up benefiting both the company and the social movement: Nike makes more money, the social movement is advanced and more widely discussed, and Kaepernick gets credibility from audiences who might not have considered him or his perspectives without a large company supporting him. Now, Gillette’s latest commercial depicts men intervening in bullying, fighting and street harassment, and it changed its longtime slogan of “the best a man can get” to “the best a man can be.” The Gillette ad seems to be straddling the two extremes, finding itself in a murky middle area. Gillette’s ad romanticizes social issues similar to the Pepsi ad but not to the same extreme degree, while it lacks the swift boldness and degree of risk in the Nike ad. Furthermore, while it does have a positive message, the commercial is so cinematic and overly doused with uplifting, inspirational rhetoric, it doesn’t seem as though Gillette believed the backlash or risk from its commercial would be on the level that Nike faced. The North American brand director for Gillette said they merely “expected debate.” However, I’m finding it hard to believe that they expected anything other than overwhelming praise for taking a progressive political stance, with a few naysayers arguing it out on Twitter. To some, the Gillette ad seemed to accuse all men of wrongdoing. Some men posted photos and videos of themselves flushing their Gillette razors down their toilets, echoing the social media backlash of people burning their sneakers after the Nike ad. While it is entertaining to imagine a far-right pearl-clutcher thinking a single razor advertisement is so outrageous that he is willing to ruin his plumbing to make a point, it’s important to remember that this kind of outrage and backlash is a part of something much bigger in society. In a way, the Gillette ad’s mediocre attempt at being political is worse than Pepsi’s failure. It did the bare minimum to be considered progressive without taking steps to actually progress the movement it supposedly supports. Gillette could have aligned itself with a figure like Dr. Christine Blasey Ford, Anita Hill or any existing organization or figure already doing work to advance the social movement. Instead, Gillette is doing a small fraction of the work while demanding all the attention and expecting all the applause. For a brand to successfully take a stand on a social justice, environmental or political issue, several criteria must be met. First, the brand must take a strong and understandable position on the issue (clarity). Second, the brand must actually be committed to the issue and be seen as “walking the talk” over time (authenticity). And third, the brand must align with those who possess recognized and unquestioned credibility on the issue (validity). If any of these criteria are not met, brand success will be limited at best, or at worst, brand damage will result from the attempt. Go forth, brave brands, but carefully.